So last couple of days in my real life the Spring seems to have changed it mind. It's been snowing a little and it's been really cold. Like way too cold for late April. Lately I've felt a bit cold in Second Life too. So much backstabbing and petty people creating drama over silly things. For the following look I chose something comfortable and familiar, something safe and not too flashy. Something that only really small minded people would and could create drama over. 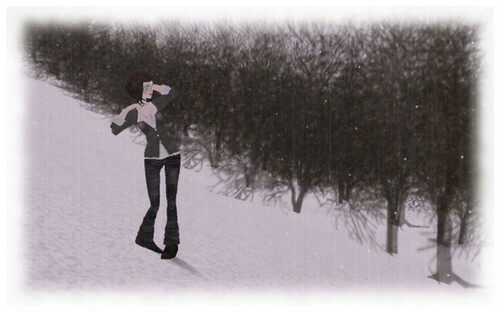 Then I took a bus to a coldest, but yet amazingly beautiful place I knew in SL and slid into a deep feeling of drama.